FIFA on Monday ruled out a greater security threat during the 2014 World Cup hosted by Brazil. FIFA secretary-general Jerome Valcke urged fans of the game and traveling supporters not to let safety fears detract from the excitement of the World Cup. “Security is an issue everywhere in the world. It also depends on the way you behave,” Valcke said in an interview published on FIFA.com. “Make sure that you just enjoy Brazil as Brazil is. If you are told in certain cities that you should not walk in certain zones, you should follow that. There are zones and parts of cities where you don’t go. It’s not only in Brazil, all over the world it’s like this,” Valcke said. Media reports have cited rising street crime and civil unrest as concerns for fans attending the June 12-July 13 tournament. Several past global tournaments have, however, all been troubled by fears of disruptions– Tibetan protests before the Beijing Olympics in 2008, crime fears before the South African World Cup in 2010, security concerns before the Winter Olympics in Sochi in Russia in 2014. Brazil’s image has been tarnished by recent clashes between police and drug traffickers in Rio’s slums and violent anti-government protests that began during the Confederations Cup last June. Valcke said FIFA has done all it can to guarantee fan safety in each of Brazil’s 12 World Cup host cities. “The security in and around the stadiums is no issue. Everything is organized here, the same goes for the fan fests,” he said. The Brazilian Tourism Ministry forecasts that the 2014 soccer World Cup will generate around 62.1 billion reais (or $27.7 billion) in revenues, three times what was injected into the country’s economy during last year’s Confederations Cup tournament. Despite ongoing construction work at three World Cup stadiums, Valcke insists the country will be ready before the first match between Brazil and Croatia in Sao Paulo on June 12. 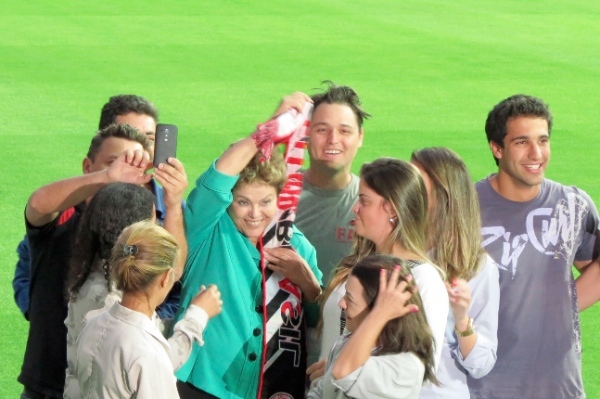 Brazilian President Dilma Rousseff’s re-election campaign will kick off in July, immediately after the World Cup concludes. Polls in Brazil are slated on October 5 and Rousseff so far is leading in all the pre-election surveys, where some 37 per cent of those polled say they intend to vote for her.